Hardly a riffle troubles Tulalip Bay on this bright mid-March morning, at least not near the marina, but Todd Sandell’s gaze is drawn off into the distance. “Looks like there’s some action over there,” he says as he settles himself into the boat. Folded in at last among his gear — he is well over six feet tall, with a substantial but well-kept gray beard — he pushes away from the dock, nodding at a churning cluster of darkish dots. On closer inspection these turn out to be dozens of marine birds: Cormorants, gulls, large sea ducks called surf scoters. “The scoters are a pretty good giveaway for eggs,” Sandell says. “We’ll definitely want to check that area out.” He thumbs the outboard’s throttle, and the Washington Department of Fish and Wildlife (WDFW) rigid hull inflatable called Defender (or, unofficially per Sandell, Herring Defender), chugs out into the bay and away from the avian scrum. Sandell is a senior biologist with the WDFW Puget Sound Marine Science Fish Group. 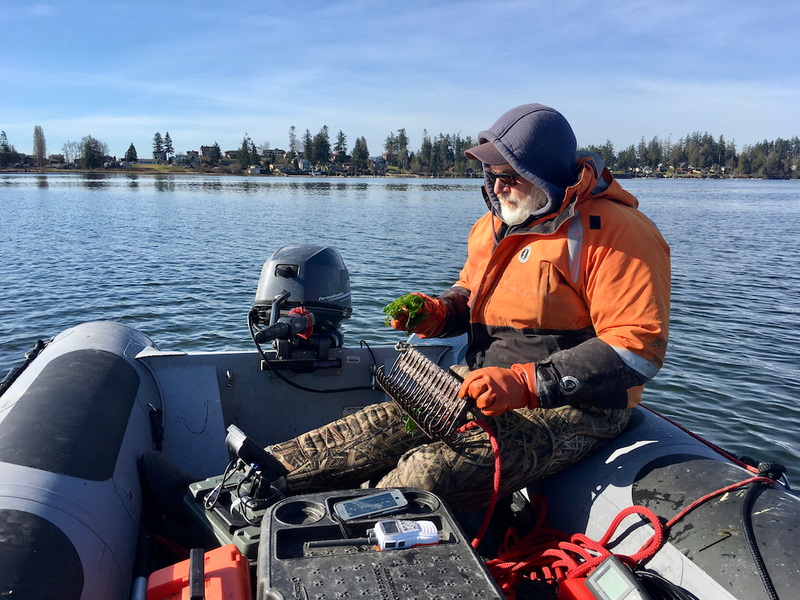 Since January, he and his staff have been boating out to survey sites throughout the southern Salish Sea, from Semiahmoo Bay at the U.S.-Canada border down to Squaxin Pass near Olympia. They are searching for the roe, or eggs, of Pacific herring (Clupea pallasii): Where they are, where they are not, and in what densities. This in turn will let them estimate the spawning biomass of the herring — how many fish, that is, would be required to produce that many eggs. 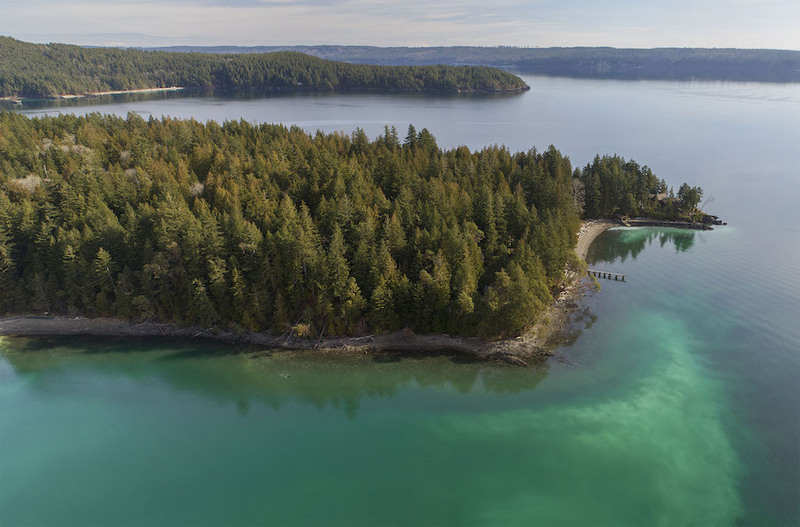 All of that information is essential, as it will help Sandell and other managers address a pressing issue about a species that sits at the heart of the Salish Sea food web. Herring numbers have been declining in Puget Sound since surveys for them began in the 1970s, but it is unclear what is causing those declines, even in the face of widespread fisheries closures. Less clear still is whether anything else can be done to stop or reverse them, and bring herring back. Across the Salish Sea, herring are best known, ecologically at least, for their spectacular spawning events. For most herring, the spawning period begins in January and lasts through April. Single events can bring so many fish into the intertidal and shallow, subtidal nearshore that the sea seems to bubble and the milt of the males turns large patches of water a vibrant, irradiated blue. The milt will fertilize the millions of eggs females have deposited on eelgrass or algae, or tree branches, or other marine debris. Having spawned, adults then leave for their summer feeding areas. Herring, unlike salmon, can spawn more than once; the oldest individuals might live 19 years, although the oldest seen in Puget Sound are typically around eight. Left alone, the eggs hatch ten to fourteen days later, filling the water with tiny herring larvae, each less than half-an-inch long. 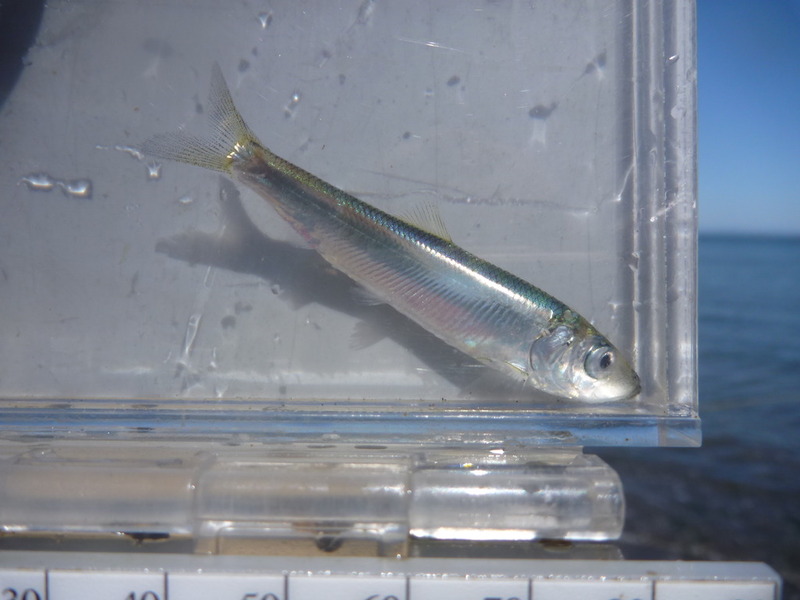 These larval fish drift from the spawning areas to mix in Puget Sound, developing for a few months until they look more like adults, with silver sides and a bluish back. Once mature, some of them will migrate out to the open ocean, where they travel in great schools; others, mostly stocks from southern Puget Sound, stay in the inland waters of the Salish Sea. After one or two years, they return to spawn, but not necessarily to their natal sites. Recent studies suggest that, rather than follow their noses like salmon, young herring are social learners, following older herring to their spawning sites, a strategy known as Go With Older Fish. Once a herring has selected a spawning site, it sticks with it for the rest of its life. Whether they migrate out to the Pacific or stay in the Salish Sea, herring are tightly bound in many strands of the regional food web. They themselves eat mostly phytoplankton and zooplankton as adults, as well as smaller fishes occasionally, but it is their role as food for others that makes them so vital to the ecosystem’s well-being. Scoters, goldeneyes, and other diving ducks feast on their eggs, as do a number of invertebrates; Sandell has even found nudibranchs, or sea slugs, gorging on the roe. As juveniles, herring are no less delectable, being a critical food source for young salmon, among other animals. As adults, they become choice fare for other seabirds, like auklets, or seals and whales. “Herring are lynchpins of the Salish Sea ecosystem,” says Tessa Francis, a biologist at the University of Washington [Editor’s note: Francis is affiliated with the Puget Sound Institute, which publishes the Encyclopedia of Puget Sound.] and co-Principal Investigator for a recent status report on herring. “Not just ecologically, but also socioeconomically and culturally.” Because, of course, it would not do to leave out one of the other central members of the Salish Sea food web: Humans. 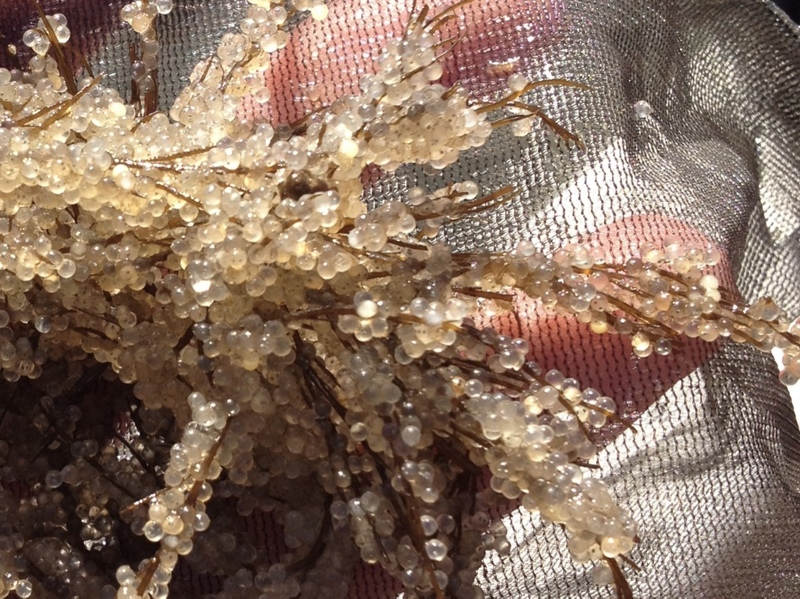 The herring roe are beige, each egg like a tiny ball bearing. They are sparsely distributed. “In terms of density, this is definitely ‘Very Light,’” Sandell says. (The scale goes from Very Light [one to 25 eggs per inch] to Very Heavy [more than 650 eggs per inch, the clusters so thick they look almost like off-brand Malt-O-Meal].) Some of the eggs are still developing, but some appear to have hatched already. “I’m going to take a sample,” Sandell says. 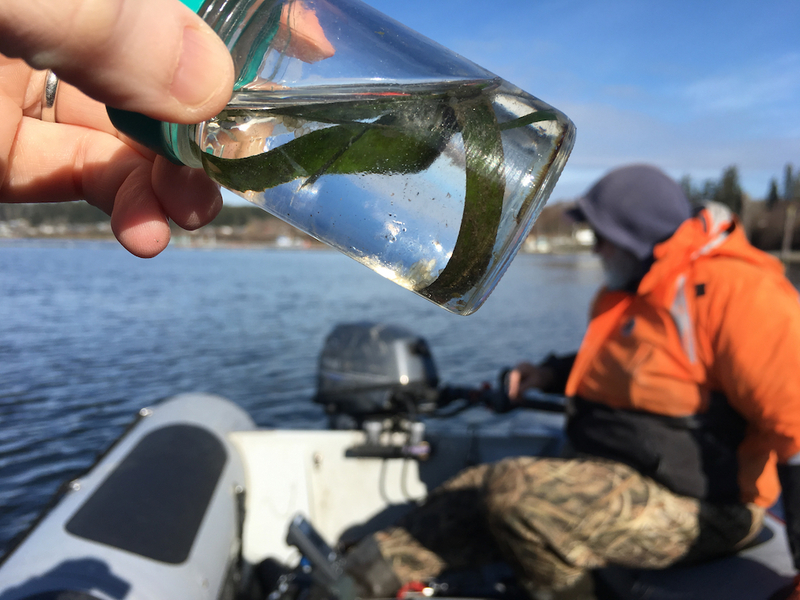 “This looks like it might be spawn-on-spawn.” He tucks the eelgrass blade into a small glass bottle, which he will take down to Olympia to get the eggs aged and see if he has the products of two separate spawning events. Tulalip Bay is one of more than twenty spots in Washington where herring spawn. Each spot’s population is demographically independent, a kind of stock-in-miniature, with different peak spawning times. Ideally, Sandell and his team of herring surveyors want to visit each stock every ten days, following a schedule plotted out in January, “before the winds come up and blow our plans all to hell.” Thereafter, sampling can become a bit ad hoc, governed both by weather and happenstance. “I’ve got eyes and ears around,” Sandell says of his herring spies, who can recognize the spawning signs and give him a heads-up. Should someone call in an event, surveyors try to get out and survey within a couple days if they can. “The egg predation can be pretty astonishing,” Sandell says. Recently, he heard from someone at Birch Bay, near the U.S.-Canada border, but by the time he was able to get out there a week later, only light spawn remained. The suspected culprits were still swimming in the vicinity — hundreds of egg-stuffed birds. “They can really make a dent,” Sandell says. Threats to herring include habitat degradation, poor water quality, and predation from marine mammals. With the arrival of white settlers, human and herring relations changed. Commercial fishing at an industrial scale began in the late 19th Century, mostly with beach and drag seines. Some of the catch was exported and some was rendered into oil or fishmeal until the market collapsed after World War I. The fishery would then enter a rough cycle of rise and fall. From the 1920s through the 1940s, most of the herring harvest was used as bait in other fisheries, such as halibut or shark. In the 1950s, herring became the preferred bait in the recreational salmon fishery. In 1957, a new set of regulations allowed for herring to again be rendered into oil and meal, leading to an increased harvest in northern Puget Sound. The harvest rose more in 1972, when a sac roe fishery began that targeted the stock at Cherry Point, near Bellingham, the largest herring stock in the state at the time. The fishery was closed briefly in the mid-1980s due to concerns over declines and reopened in 1988. But the Cherry Point stock declined again, as did herring throughout Washington, and in 1995 all commercial fisheries were closed. Those closures are still in effect, save for a small sport bait fishery that averages about six fishers who harvest around 200 tons per year, or about 5% of the annual spawning biomass estimate. Once the most abundant in Puget Sound, the stock at Cherry Point near Bellingham has declined 97% since 1979, going from a spawning biomass of around 14,000 tons down to less than 300. “There’s a lot of development around here, so this site isn’t as picturesque as some,” he had said earlier, but near Camano the scene changes. A pair of gray whales surface nearby —Sandell steers to give them a wide berth — and trees cover the bluffs. They tower, forming an almost sheer wall over the narrow cobble beach that Sandell pulls up next to. But even as it is more aesthetically pleasing, there are no herring eggs. In this, the Port Susan stock mirrors the state of many stocks in the southern Salish Sea. But while the estimated total spawning biomass of herring has declined since 1973, the internal dynamics are complicated. Much of the regional decline is driven by the stock at Cherry Point. The stock there is genetically unique, in that the herring start spawning in April, and keep going through June. Cherry Point larvae have been found to have a higher thermal tolerance than larvae from elsewhere. “They’re better adapted to warm water,” Sandell says, and this would seem to bode well for them under certain climate scenarios. The only problem is that the stock has declined 97% since 1979, going from a spawning biomass of over 14,000 tons down to less than 300. Other stocks, though, show different trends. 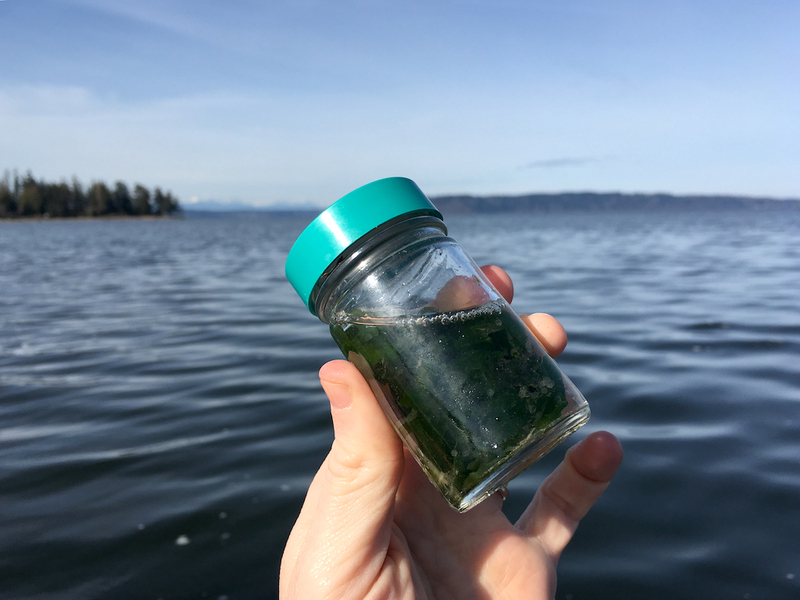 The Quilcene stock, in Hood Canal, has actually been increasing, to the degree that, since 2016, it has contributed over half of the spawning biomass in all of the southern Salish Sea. “If you look at the recent history of herring in Puget Sound,” says Paul Hershberger, a biologist with the U.S. Geological Survey, “you see they go through these large swings. So Quilcene may have a lot of biomass now, but that probably isn’t sustainable.” Exclude the Quilcene stock, and the overall picture for the southern sites looks increasingly dire, although not quite as dire as Cherry Point. Threats to herring include habitat degradation (through loss of submerged vegetation and shoreline hardening), poor water quality, and predation from marine mammals in the southern Salish Sea that are going through large population increases, such as harbor seals. Overcoming these threats is the next challenge. 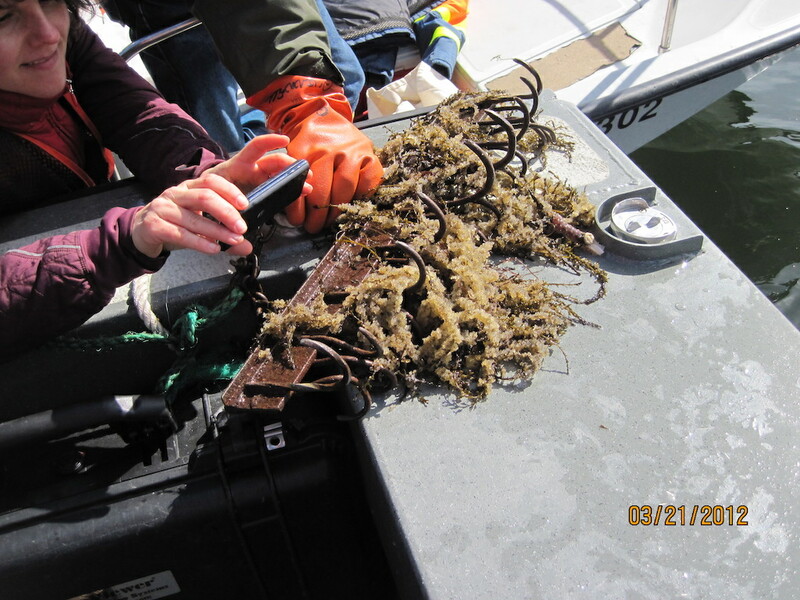 Although in 2013 the Puget Sound Institute convened a panel to study ecosystem-based management of forage fish, no one has put forward any specific plans to recover herring stocks in the southern Salish Sea. Some solutions have been proposed, however, from excluding seabirds from select spawning areas to reduce predation pressure, to doing the same with seals. Still, as Phillip Dionne, a biologist with WDFW points out, herring were declining long before seal populations began to increase, so while it is easy to blame predation because the predators are visible, a suite of factors is likely involved. If these stocks are to recover, he argues, larger land use and development issues will have to be addressed. By the time Sandell has finished surveying around Camano Island, what was supposed to be a quick survey that might take the morning has gone until late in the afternoon. The wind has picked up a little, and the temperature is starting to drop with the sun when he returns at last to the enclosed bay, and motors to the spot where he had noted the earlier bird activity. “I’m pretty sure they were all around here,” he says, and over the side goes the rake. The rake enters the water with a sploosh and disappears, while Sandell plays out the thick red rope to which it is attached. “This could be pretty interesting,” he says. The boat putters forward a few yards and he hauls it back up, not exactly quaking with anticipation — he is too experienced a herring biologist to hope for much around here — but perhaps mildly more excited than he has been for the past forty-five minutes or so. When he pulls up the rake, though, its teeth hold only a couple of stones, so smooth as to seem polished. Sandell looks at them. “No eggs,” he says. “Not even veg.” He looks up. “Huh. I guess all those birds were after something else.” He looks over the side of (Herring) Defender, as if the adult herring might be visible, but they are not. He shrugs and takes the stones from the rake and kind of bobbles them in his hand, and then chucks them back into the bay. Eric Wagner writes about science and the environment from his home in Seattle, where he lives with his wife and daughter. His writing has appeared in Smithsonian, Orion, and High Country News, among other places. His most recent book is Penguins in the Desert published by Oregon State University Press. He is currently writing a book about Mount St. Helens.